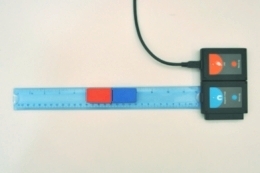 A bar magnet has two ends, known as the magnetic poles. One pole is called the north pole of the magnet and the other pole is called the south pole of the magnet. Unlike magnet poles attract each other and like poles of magnets repel each other. Magnets also attract other materials which are not normally magnetic (various sorts of metals). They create a magnetic field in the space around them. A compass needle is a magnet and it always point to the geographic north (unless it is interrupted by another magnet), lining up with the magnetic field of the earth. The magnet’s field strength varies inversely as the square of the distance from it. 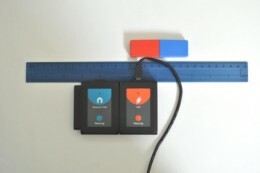 This kit allows students to compare, in a very simple way, the magnetic field of two different magnets. Also, the dependence of the intensity of the magnetic field on the distance is easily experienced. 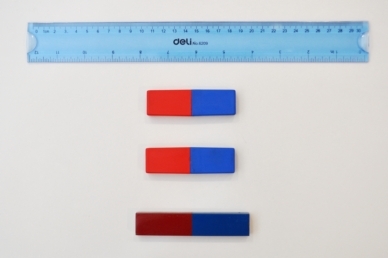 Alnico bar magnet, Two magnets in plastic cases, Ruler.